within 30 days. The licensee should take the actions listed in their ODCM. Because the 1-131 (and possibly other radionuclides) from Fukushima will elevate the “background,” it will reduce the licensee’s ability to differentiate releases from their site. Strong data evaluation and analyses are appropriate at all times, and are particularly applicable at this time. activity is from their facility, then the licensee would be required to make a 30-day report to the NRC. 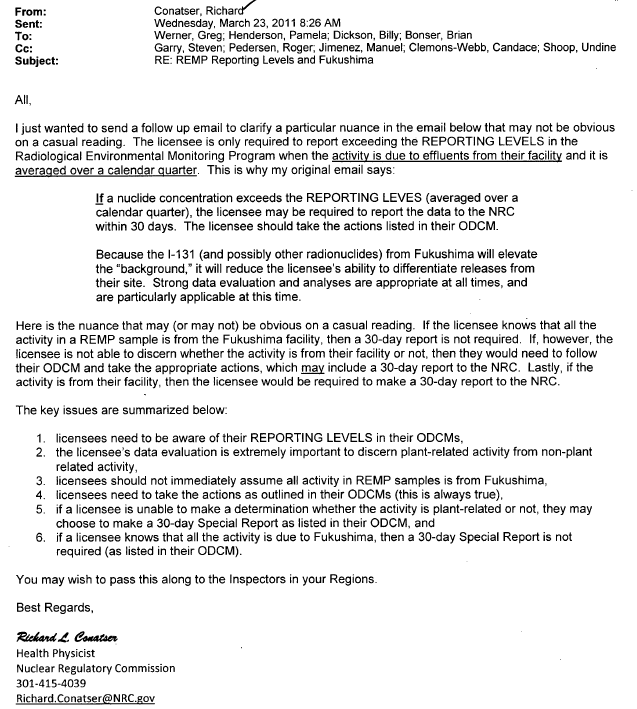 6. if a licensee knows that all the activity is due to Fukushima, then a 30-day Special Report is not required (as listed in their ODCM). You may wish to pass this along to the Inspectors in your Regions.